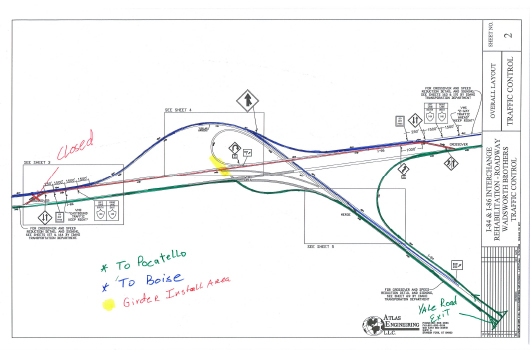 Traffic will be detoured overnight next week for motorists heading eastbound on Interstate 84 from Burley toward Pocatello as crews work to place girders on the newly constructed bridge. This is part of the Salt Lake Interchange replacement project, underway since May of last year. Construction is scheduled to finish by late 2020. This temporary traffic pattern is expected to be in effect between the hours of 9 p.m. and 5 a.m. during the nights girders are placed. Work is anticipated to be completed within a week. Drivers should still anticipate reduced speeds through the work zone and pay close attention to signage which will be in place to safely direct motorists through the area. Wadsworth Brothers Construction, of Draper, Utah is the prime contractor on this project.